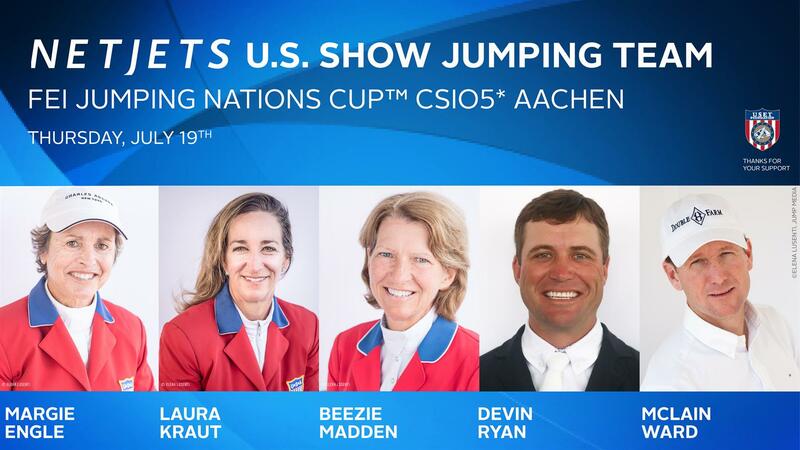 Lexington, Ky. – US Equestrian has named the NetJets® U.S. Show Jumping Team for the FEI Jumping Nations Cup CSIO5* Aachen on Thursday, July 19, 2018. The competition is part of the World Equestrian Festival CHIO Aachen, running July 13-22. This event serves as a designated observation event for determining the 2018 NetJets U.S. Show Jumping Team for the FEI World Equestrian Games™ (WEG) Tryon 2018, which will take place Sept. 11-23 in Mill Spring, N.C. A list of the designated observation events can be found here. Kent Farrington (Wellington, Fla.) has withdrawn himself from the short list in consideration for the FEI WEG Tryon 2018 NetJets U.S. Show Jumping Team. After evaluating the form of his short-listed horse Gazelle, the 12-year-old Belgian Warmblood mare he owns with Robin Parsky, following his return to competition post injury this winter, Farrington believes it is in Gazelle’s and the team’s best interests not to purse WEG selection at this stage. A replacement will not be made to the short list in accordance to the U.S. Show Jumping selection procedures for the 2018 WEG. View the complete list of short listed athletes here. The U.S. will also be represented at CHIO Aachen by the Land Rover U.S. Eventing Team in the FEI Eventing Nations Cup™ CICO3* Aachen from July 19-21 and The Dutta Corp. U.S. Dressage Team in the FEI Dressage Nations Cup™ Germany, July 17-22.